for the “Taste of Spirits” events are only available at the ticket counter located at the entrance of “Central” (Linz) or “Urania” (Vienna) on the day of the event. Reservations will not be possible and entrance will be granted on a “First Come, First Served” basis. is € 12 per person. This includes a spirits tasting glass & the Special Dram. 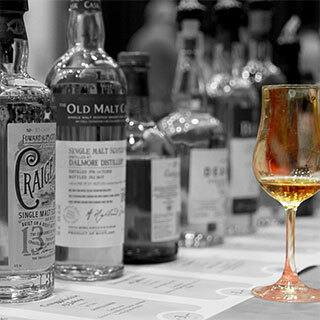 event is an exclusive tasting opportunity for spirits lovers and enthusiasts who are at the start of their tasting journey and want to further explore their sense of taste, as well as for people who want to discover and taste from our approximately 200 bottles of new and exciting spirits. We offer our guests a large variety of spirits from our collection. The participants can choose from different single cask bottlings or bottles, which will be made available from our archives specifically selected for this event. For a small fee per shot, guests will be given the opportunity to select and experience very unique and rare flavors. Start by visiting our Champagne winegrowers and sensitizing your taste buds with a glass of champagne while perceiving the various nuances of flavors in a relaxed environment. We will be showcasing distillates of the following raw ingredients: barley, cane sugar, juniper and much more – you can experience chocolate, cedar, coffee, wax, fleur de sel, lemon zest, sherry, morello cherry, manuka honey, smoke, pea, penja pepper – to name a few. Following the theme “Immerse Together in the World of Spirits” – high-caliber experts from the industry will be available for discussions and to answer questions you may have. This will allow you to get first-hand information from the producers and learn more about the different approaches, styles and philosophies of different bottlers. Details about this years the experts will follow shortly.